Just finished the iOS 5 update on my iPad 2. Man, what a marathon. It basically needs to back up your data, reset the device, update the OS, then restore your data. So plan for a few hours to completion. I have no idea how people without a computer (wasn’t that the promise?) would do this. When update was “finished” I noticed I only had sound in apps that specifically were made to play sound (like Garage Band for example.) Very strange. Took about 30 minutes to realize that Apple had reset the option of how the physical switch near the volume control buttons work. I’d set that against the default, so it managed locking screen rotation (the original function, and absolutely necessary for those of us who read in bed.) They set it to control sound muting, and apparently the setting for free rotation is the same as mute. Wow, I imagine this is going to burn a few users. Second is that apparently some downloadable content may be corrupted or just not migrated properly. Comics on Graphic.ly all came up as black pages. Had to uninstall the Graphic.ly app, then reinstall and redownload the issues I’d put in my library. Luckily that was only about a dozen, but that could be really painful for someone who bought a lot of comics. Biggest disappointment: Siri is not on the iPad. There’s really no good reason for this, other than to drive people to iPhone. And we’ll have to see how well that works. Android voice commands work very well, and is integrated in all the right places, but I rarely use them. 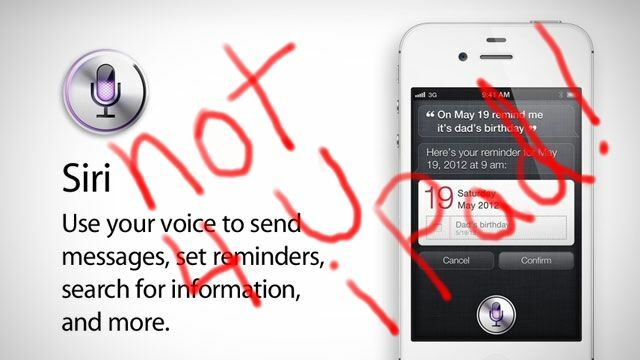 Siri is not a game changer, it’s just a game. Reminders task List – Frankly anyone who isn’t using WunderList will be pleased with the Apple task list app. However, it’s not near as cool as Wunderlist, is not cross-platform, does not sync to your Windows or Android devices… well, let’s just say I’ve buried this app inside a “Utility” folder to keep it out-of-the-way. Why Apple made this lame addition an “essential” app, one you can’t delete, is just mind-numbing hubris. Go find Wunderlist and thank me later. Grid in Camera. Don’t get me wrong, the rule of threes is essential for good composition. However just adding a grid to the camera is so Apple – no documentation or help in figuring out why you would turn it on. Come on Spartan design sense, surely even you can give a hint now and then. Newstand. Just another Apple money grab. My non-newstand publications sit on a page around a Newstand app with two demo pubs in them. It just looks lame and yes! You can’t delete this Essential app either. May update as I learn more. This entry was posted in Business, Design, Geeking around, Random thoughts, Software, Technology and tagged apple, geek. Bookmark the permalink. Hey man – saw you had some issues with the Graphicly app. Im really sorry to hear that. Would you be willing to send me your graphicly email to micah@graphicly.com so I can send you a promo code for some free comics for your trouble? Also, we launched comics on the Newsstand today – a bunch of Image titles, like The Walking Dead, and will launch many more soon. Its a different reader application (I think a better one). Again, I apologize for your trouble.